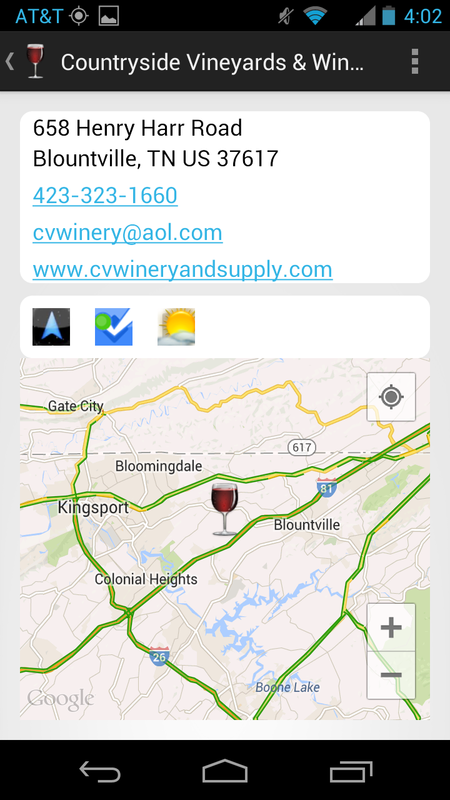 Being a resident of the Old Dominion, I am somewhat familiar with the wines produced from the 210 or so wineries operating in the Commonwealth. Many of my favorites are included in this Northern Virginia Magazine post on Wine Recs From Local Winos. And there is such nice grape variety in Virginia - from Viognier, Chardonnay, Bordeaux varieties, Vidal Blanc, Petit Manseng, Albarino, and of course, Norton. 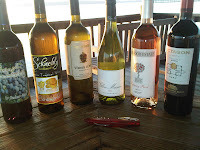 And yet, I have been able to narrow my favorites to The Trifecta: the Glen Manor Vineyards Sauvignon Blanc, the Boxwood Winery Rosé, and the Barboursville Vineyards Octagon.Why these? 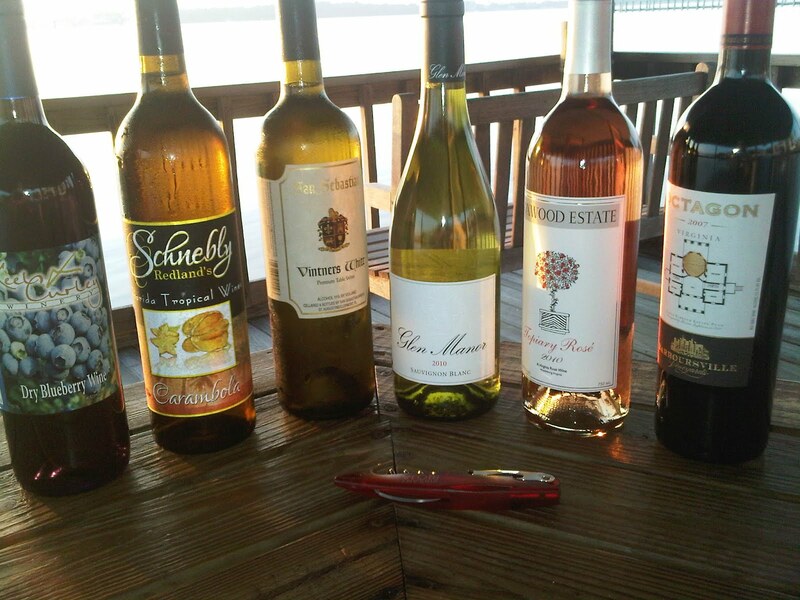 Just check out the VirginiaWineTV video below comparing these wines to some I found in the Sunshine state. Cheers. 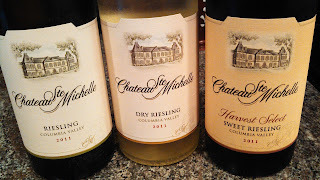 Last night, Wednesday September 20th, our friends William and Juli, co-bloggers at Kiwi Day Dreaming hosted a session on Wines of New Zealand for #winechat. For the event, William and Pasternak Wine Imports provided us with two Sauvignon Blancs, the Dashwood Sauvignon Blanc Marlborough 2011 ($12) and the Goldwater 2010 Wairau Valley, Marlborough ($16). During the chat we also learned bushels of new facts about the New Zealand wine industry, the Malborough region, and the Wairau Valley sub-region. Specifically, I was fascinated to learn that Sauvignon Blanc from the Wairau Valley characteristically express sub tropical fruits in the finish. And this was identical to my tasting notes for the Goldwater 2010. And the aroma from this one is strong, overpowering so, where the citrus leads to a rich wine - depth and flavor - and a long nicely acidic finish. The Dashwood was lighter, with a nose and flavor of grapefruit and a touch of lemon without the grass. The finish, refreshing acidity with some minerals mixed in. Both are nice wines, nice price points - time to start exploring New Zealand wines. has exploded because of its vineyard hardiness (cold and humidity) and diversity in styles. It can be vinified into a full or medium bodied dry red, a rose, or even a sweeter wine. 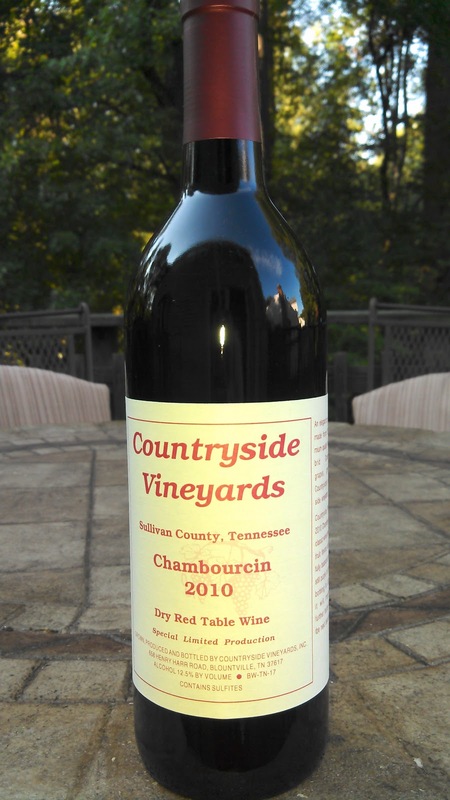 Countryside's Chambourcin is a medium bodied wine, with smooth cherry-chocolate flavors, and a slightly peppery finish. The is a nice, easy drinking wine; affordable ($13); and worthy of the winery's praise. It's still the Summer of Riesling so we turn to Idaho where Sommelier Vino50.com recommended Sawtooth Winery and we selected their 2011 Riesling (a blend of 95% Riesling and just 5% Muscat Blanc). Any discussion of Northwest wine production should not be monopolized by Oregon and Washington; Idaho and British Columbia should be included - particularly since the first vines in the Pacific Northwest were planted in Idaho in the 1860s. The terrior in Idaho is similar to that of eastern Washington & Oregon except its higher elevation produces a larger diurnal temperature variation. We are talking 30*-40* at the highest elevations. The Snake River Valley was Idaho's first designated American Viticultural Area (AVA) and encompasses the strategic 43°- 46° latitudes. 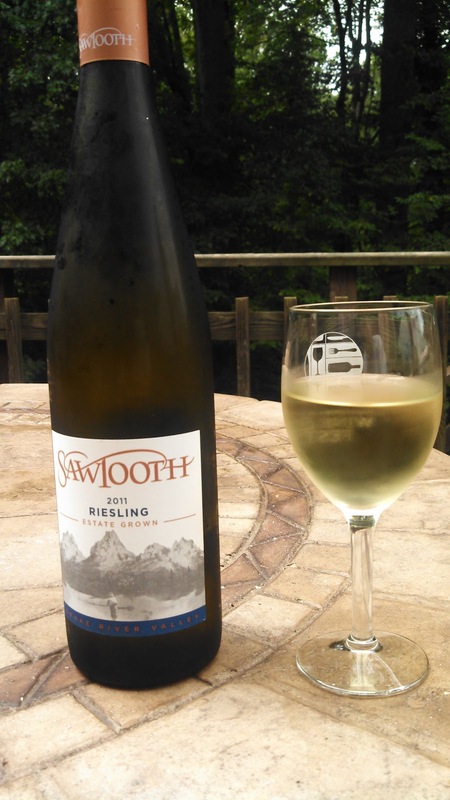 Sawtooth Winery was founded in 1987 as started as Pintler Cellars, with early plantings of Chenin Blanc, Riesling, Semillon, Chardonnay, Cabernet Sauvignon. 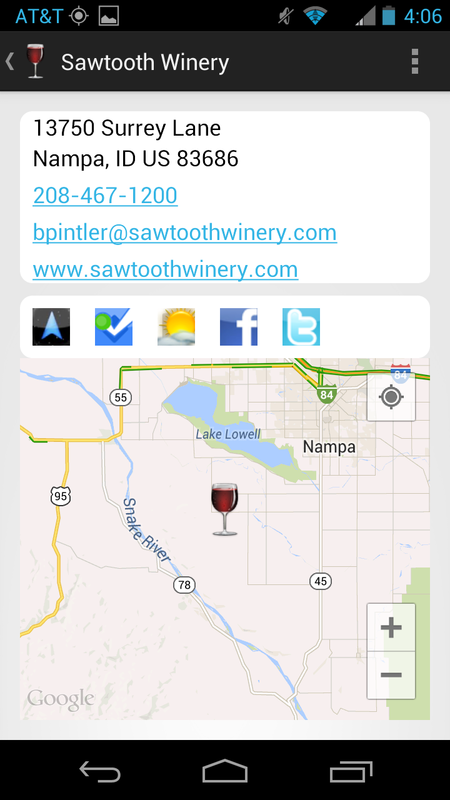 In 1998 Pintler joined Corus Estates & Vineyards and was re-branded as Sawtooth Winery - honoring the Sawtooth Mountains. 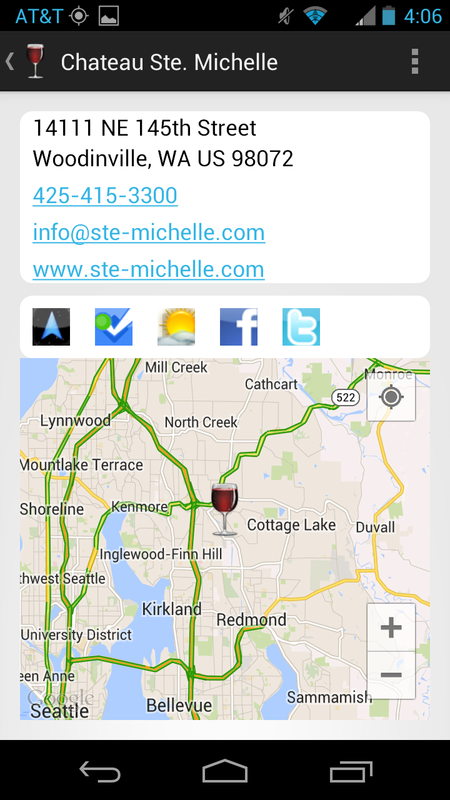 Today Sawtooth is one of about forty wineries operating in the Gem State. The grapes for the 2011 Sawtooth Winery Riesling were harvested from the winery's Skyline Vineyards, a new vineyard with slopes facing in all directions. The east and north facing slopes are planted with cooler climate grapes such as Sauvignon Blanc and Riesling; whereas the south and west facing slopes are warmer and host Bordeaux varieties such as Cabernet Sauvignon, Cabernet Franc and Merlot. Interesting - different micro-climates within he same vineyard. The wine is made semi-dry with 2.0% RS but tons of acidity to balance the sugar. The aroma exudes peach, whereas the flavor is primarily lemon grass similar to some Sauvignon Blancs. There is also a honey richness to the wine that is followed by the pleasing acidic finish. Also pleasing is the price, $12 at Norms Beer & Wine. Cheers to that.